Happy February! Whether you’re hitting your stride with New Year’s Resolutions to eat better, just getting those new healthy habits off the ground or looking for a comforting dish full of vibrant flavour that hints at warmer weather, this marinade fits the bill. This classic marinade couldn’t be easier and I use it all the time for everything from healthy suppers to al desko lunches to picnics to dinner parties. 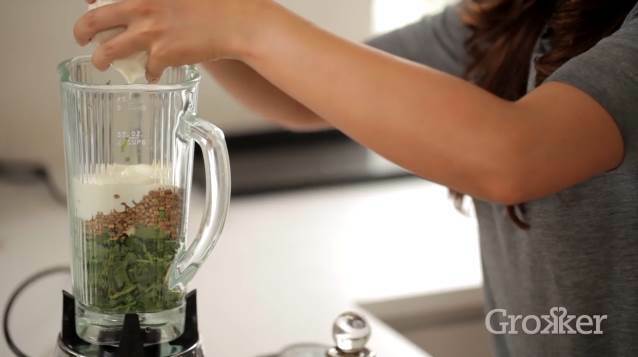 You just pop it all into a blender, whizz and then use it to paste anything you like: pieces of chicken, fish, meat, vegetables such as broccoli or aubergines or seafood such as prawns, lobster and scallops all work. I have used it to coat a whole roast chicken for a tasty twist on Sundays, chicken drumsticks for sports evenings, whole fish, whole legs of lamb for dinners (and butterflied for barbeques), chops, steaks and skewer kebabs. It also makes a great filling when used to stuff a large salmon fillet halved widthways, covered in foil and then roasted. It has a warm, aromatic, herby fragrance with that lovely hint of citrus that coriander leaf gives off and can be made as mild or as hot as you like, leaving a yummy crust that has texture and crunch from the cracked coriander seeds. Substitute the natural yoghurt for coconut milk yoghurt if you’d prefer a dairy-free version. 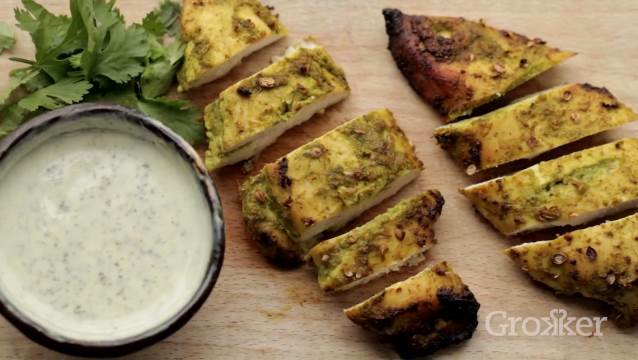 I have used it here on juicy chicken breast, which is perfect for suppers or lunches, but this is also brilliant for smaller bite-size pieces for a different take on chicken tikka, especially when chargrilled or griddled on a thawa. Any leftovers are also superb with some good quality bread for a gourmet sandwich, or tossed into a stir fry or added to fresh vegetables, noodles and broth for a nutritious soup. Preheat the oven to 400°F (200°C). 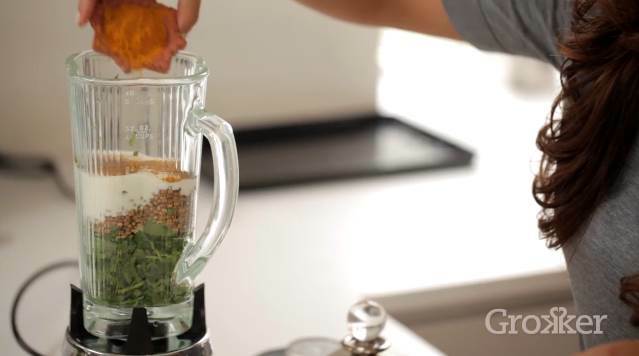 Place all the ingredients, except the chicken, in a blender, mini grinder or food processor and blend to a thick paste. It’s nice to keep it a bit chunky so you still get the crunchy texture of the coriander seeds. Rub the paste all over the chicken (use surgical gloves if you don’t want the turmeric to stain your nails yellow! ), cover and marinate in the fridge for at least 30 minutes or preferably overnight for the best flavor and tenderised flesh, but otherwise rub in well and cook straight away! Shake off any excess marinade and place the chicken on an oiled baking tray. Roast for 30 minutes, turning over halfway through or, alternatively, barbeque until cooked through. 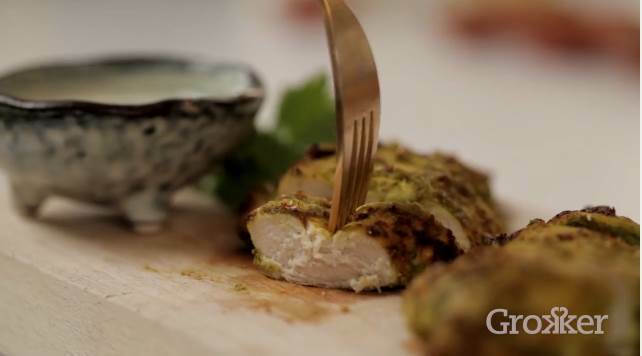 Come and watch the video of how to make these Green Masala Coriander Roast Chicken Breasts on Grokker! Very well explained with perfect pictorials. Lovely book review of Cooking Like Mummyji in The Independent, Brighton & Hove! Can’t wait to come meet you all in Brighton for this SOLD OUT event! WIN A SIGNED COPY OF COOKING LIKE MUMMYJI! What is Cooking Like Mummyji?